Got two very different comments last week from two of my readers. The first is from John. See, John’s implying that I’m a hypocrite. The overall message of Home Studio Corner is that improving your skill level is the only guaranteed way to improve your recordings. No amount of gear will make YOU better. But that doesn’t mean good gear doesn’t have its place. Just because Eric Clapton could make a $99 Strat sound like a million bucks doesn’t mean Eric plays $99 Strats on tour. Because he invested the time in becoming a phenomenal guitarist, thereby making him one of the most qualified people to play really nice, high-end guitars. Want to play guitar like Clapton? You don’t start by buying a $15,000 guitar. You start by playing the crap out of your $99 one. “I saw this at the bottom of a web page this morning and thought you’d get a kick out of it. It’s a little harsh, but hits the nail on the head of learning to use the gear you have. If you buy better equipment without first becoming better yourself, you’re setting yourself up for disappointment. Good gear isn’t the devil. It’s also not the savior. If you can’t get a good-sounding recording with basic gear, you won’t be able to get a good-sounding recording with high-end gear. But if you master the gear you own, you open the door to nicer, higher-end pieces. In a sense, you EARN the right to use the high-end stuff. Because I know how to place microphones, and I know how important it is to hire a really good drummer with really great-sounding drums, I’m able to get a really cool sound with a really nice preamp. Remove the last 5 words from that previous sentence, and it’s still true. The preamp is just one piece of the puzzle. To me, things like guitars, drums, mics, and preamps make the biggest impact on the sound of my recordings AND my mixes. Focus on skills, and you’ll get better. It applies to mixing, too, tiger. That’s why Dueling Mixes exists. 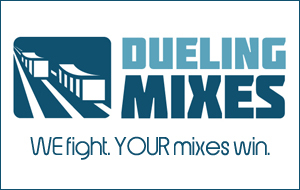 To make YOU better, thereby making your mixes better.